BURUNDI COUP: ARMY CALLS IN FOR REINFORCEMENTS FROM PROVINCES. Soldiers backing the coup d’etat in Burundi’s capital are anticipating the arrival of reinforcements as three military units made their way to Bujumbura, a source close to the Ministry of Defence told IBTimes UK. Maj Gen Godefroid Niyombare on Wednesday (13 May) announced that the army was taking over the country in a coup d’etat, as President Pierre Nkurunziza was travelling to Tanzania where he was supposed to meet East African leaders to discuss the violence in Burundi. The factions of the country’s armed forces that back Nkurunziza, led by Army Chief of Staff Gen Prime Niyongabo, were this morning said to be in control of key positions such as the presidential palace and main radio station RTNB. However, IBTimes UK understands the army reinforcements are expected to join the soldiers backing the coup d’etat who have been planning to re-take « by force » the two state institutions. 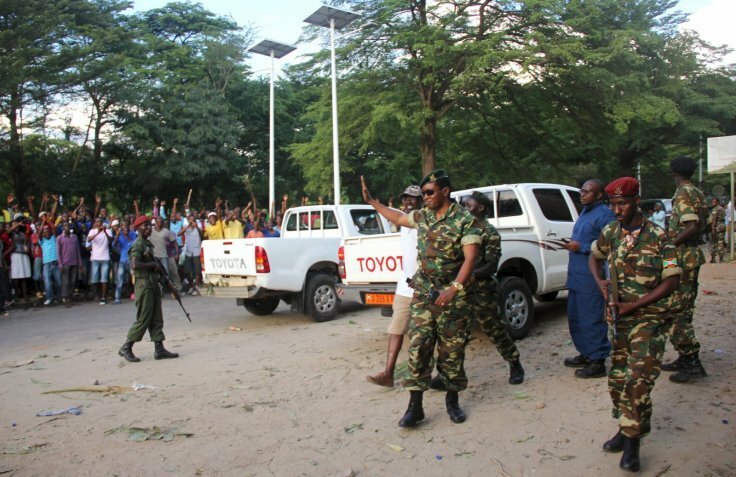 The Mwaro and Ngozi units are on their way to the capital, while troops from Musaga province have already entered the capital, sources close to the Ministry of Defence said on Thursday (14 May) morning. « The military unit from Musaga has already arrived to support the putschists in Bujumbura, » Pierre-Claver Mbonimpa, the leader of Burundi’s civil society and opposition figure, confirmed in a phone interview with IBTimes UK from Bujumbura. Another source confirmed Mwaro troops, who control much of the army’s weaponry, are on their way. According to the source, troops from Ngozi, « the president’s province », are expected to arrive later Thursday. While the president was born in the capital Bujumbura, he grew up and was educated in Ngozi province, where he built two « European-style » football stadiums. (11:15 GMT 14 May): Witnesses confirm heavy fighting and shelling can be heard near the state-run national broadcaster RNTB in Burundi’s capital, Bujumbura. A witness, hiding some 800 metres away from the building, told IBTimes UK the shots fired came from « heavy weapons » – supposedly armoured vehicles. « We can hear very loud shelling from tanks. They (army tanks) have surrounded the building, » Pierre-Claver Mbonimpa, the leader of Burundi’s civil society and opposition figure, confirmed in a phone interview with IBTimes UK from Bujumbura. While the situation is still very unclear, sources have told IBTimes UK a divided army has taken different stands in this conflict.